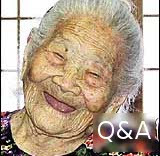 Last time on Q&A, we talked about lecherous old men and how they will pay young women to do terrible things like write friendly e-mails for money in this country. Today let's turn the tables a bit and look at a self-help guide for Japanese women hoping to make it with a younger guy. Guys are prideful things, huh? And for a couple with an older woman, it seems like the woman is always taking the lead. But at the same time, she'll accidentally say things like "I can't count on you," or "It's not like you'll be able to anyway, so just let me handle it" without thinking about it. Especially in front of other people, be absolutely sure not to take an attitude that makes him feel unappreciated. If you look down on him, you'll deeply wound his pride. Younger boyfriends are cute because there's something helpless and uncertain about them. If he's troubled by something, most of us just want to give him a hand and help him out, right? At first, he might smile, and you'll feel happy for making him feel that way. But if you continue helping him at every problem, he'll start to take it for granted that you'll do everything for him. Then rather than being a couple, you'll be like his mom. No matter how overjoyed you were to be taking care of him at first, you'll find yourself dissatisfied and saying things like, "I'm not your mother! And I'm not your maid!" This isn't a good relationship to be in. So, to make sure it doesn't happen, you need to be careful about lending him a hand or taking care of things for him too often. In a couple with an older woman and a younger man, the woman always seems to be the stronger one in the relationship. And among those couples there are some where the woman is clumsy about finding ways for herself to depend on the man. Guys like to be relied upon! They want you to let them take care of things! When they spend time with a woman that lets them do those things, they think you're cute and want to protect you. So even if in daily life you're taking the lead in your relationship, you need to let yourself be coddled. Not only for couples with an age difference but for all couples it's important to think about each other's wants and feelings. We all want to be in relationships that make both people feel good, right? The Japanese verb 甘える (amaeru), loosely meaning "to express dependence on another," is a cultural phenomenon discussed extensively by Japanese psychoanalyst Takeo Doi in his book The Anatomy of Dependence (甘えの構造). Among Doi's insights in the book is the idea that Japanese are born into then aspire to an ideal state in which they are indulgent in the goodwill of all those around them. Doi suggests that the Japanese language reflects this ideal with its customary use of keigo and teineigo used to address both infants and people in position of high social status, from grandparents to company executives. Whether you think Doi has some good points or dismiss it as a bunch of bunk, 甘える remains a well-known and well-used word and concept in Japan that can be difficult to express concisely in English. Am I the only one who thinks these posts are weird and do not fit with the general tone and sentiment of the rest of the site? And that they are not that funny, unless you like making fun of Japanese people and blaring stereotypes already overplayed on other Japanese "culture" websites. Are they supposed to be a looking glass into the crazy world of Japan according to one poster and one translator on the internet? They seem more like prejudice hiding in sweeping generalizations under the guise of being humorous or "entertaining". If I need to be constructive in my criticism, I just wish you would choose something not as obviously cliched when one examines Japanese culture. You know, use your translating powers for good. I, for one, have read more than enough stories in western media about compensated dating or birthday cake women looking for younger men. You should do a question on so called "herbivore men" next for something fresh. To clarify, when I said "one poster" I meant the person on Yahoo Chiebukuro and "one translator" I meant the poster here. I'm sorry you feel that way, Kaze. We have a number of posters and various paths which this young but developing site is taking. Hopefully there is something else here which will keep you coming back. A good way of translating the doi expression "Amaeru" is to think of the English word "indulge" and then turn it on its receiving end, indicating someone's capacity to let themselves be indulged. It indicates an uncomplicated relationship (sunau) without reticence (enryo), the kind that small infants do so naturally. It appeals ot the maternal instincts and to a thrid party observer can be viewed as "childish". Another way of looking at it is when a dog lies on his back for some tummy rubbing. Or nuzzles in for some petting. Kaze needs to calm down and read the article. I'm not sure why she/he would overact in such a fashion. To authors: keep it up. Don't let haters bring you down. Good read.